The festival of water is coming to an end but the charm of water will remain forever in a collection of photography being displayed at YellowKorner Gallery. The collection portrays water in different characteristics and meanings as seen through the lens of recognisable photographers worldwide to encourage unprecedented discovery. 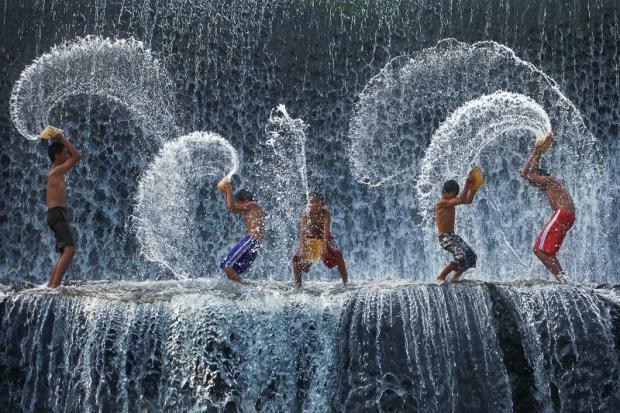 While Nicholas Bets' Water Groove reveals the feeling of being fulfilled and amused produced by the cold and freshness of water, Rarindra Prakarsa depicts the idiosyncrasy of water drops in Water Harmony which was captured within a blink but displays the romp of splash narrated by human's creativity. The underwater world was explored in Ronde Des Dauphin by Richard Hermann, the master of underwater photography who has been travelling around the world to explore underwater wonders. The work illustrated water on a larger scale as a home to aquatic creatures. Ludwig Favre used light and shadow at the time taken to mimic the atmosphere in Blue Lagoon that shows water as a form of a heaven-on-Earth relaxation echoed by the posture of visitors enduring a moment of repose. Hailed as the king of digital photography, multi-award-winning Ly Hoang Long from Vietnam echoes his home country's greatness in Fishing On The Nam Ka Lake that reflects peace of mind through the imperturbability of a peaceful lake. YellowKorner is located on the 4th floor, Helix Quartier of EmQuartier on Sukhumvit Road.